Wyoming State Geological Survey (WSGS) Director and State Geologist, Tom Drean, is retiring from the position this fall after six years of service. His departure is effective Nov. 21, at which time WSGS minerals and resources manager, Erin Campbell, will assume the role (see story on right). The state geologist additionally serves on the WSGS Advisory Board, Wyoming Oil and Gas Conservation Commission, Wyoming Board of Professional Geologists, Wyoming Consensus Revenue Estimating Group (CREG) and the Enhanced Oil Recovery Institute Commission, at the University of Wyoming. Drean was a former ConocoPhillips president for Iraq before Gov. Matt Mead appointed him to replace Wallace Ulrich at the WSGS in December 2011. 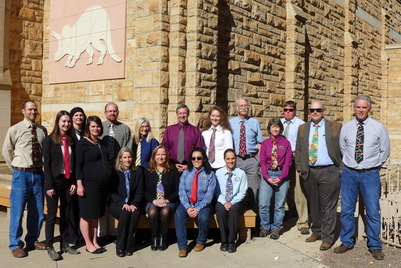 Reflecting on the half dozen years leading the Survey, Drean says he will miss the opportunity to work and interact with people from across Wyoming on a daily basis. “It has been a great privilege and honor to have the opportunity to do so, and I feel very fortunate and thankful to those who have made these six years memorable and rewarding,” Drean says. Since coming on board at the WSGS, Drean has overseen staff publish nearly 80 publications, including maps and reports useful to everyone from professionals to tourists. Other successes in his tenure include transitioning to digital platforms such as interactive maps (oil and gas, groundwater and geochronology) and providing publications as free downloads. Drean says what he appreciated and enjoyed the most about his job was the wide variety of work and, at times, unpredictable challenges that cropped up and faced the agency. “Most memorable was the curiosity and joy in a child’s face and voice when they were having a question of theirs answered about a rock, fossil or geologic feature,” Drean adds. He says the WSGS plays a key role in Wyoming in ways he believes many don’t understand or fully appreciate such as the important estimates that go into CREG and the identification, characterization and understanding of the natural resources that are important to the state and nation. Drean believes the role of the WSGS in the state has strengthened over the years, an improvement he credits to the staff. “Their pride in Wyoming and overall desire to contribute and make it an even better state than it already is shines through and is reflected in their work and day-to-day contributions,” he says. WSGS director, Tom Drean, (pictured center, back row) is retiring from the Survey after six years in the position. Geologists spent more than a combined 2,000 hours in the field on three mapping projects recently published under WSGS' StateMap program. Two of the maps depict bedrock geology, structure and energy resources. The third examines surficial geology and Quaternary-age faulting. All three are at a 1:24,000 scale. "This has been a productive and successful field season for the Wyoming State Geological Survey, and I am proud to say that the work was completed on time, under budget and most important of all, safely,” says WSGS director, Tom Drean. The three maps are accompanied by written reports and are available as free downloads from the WSGS sales site. The preliminary surficial geologic map of the Muddy Gap area in northwestern Carbon and southeastern Fremont counties comprises portions of six 7.5' quadrangles. It also contains the Muddy Gap segment of the South Granite Mountains fault system. Geologists found surficial deposits ranging from bedrock outcrop to alluvium across the area. The second map published is a bedrock geologic map of the Fort Steele quadrangle in Carbon County. The investigation provided critical information about the depositional history of the Mesaverde Group. A subsurface type log was created for the area, which has oil and gas development potential, and serves as an outcrop analog for these same reservoir rocks in the nearby subsurface. The final map, also a bedrock geologic map in Carbon County, is the Bridger Pass quadrangle. This project includes a type log that will be valuable for nearby energy development. Additionally, coal quality in the Almond Formation, a locally significant coal source, was determined. Total organic carbon was analyzed from the Niobrara Formation that will provide information for future unconventional oil and gas resource development. Current StateMap projects under development and scheduled for release in spring 2018 are preliminary bedrock geologic maps (all at 1:24,000 scale) of the Gas Hills quadrangle (Fremont and Natrona counties), Albany quadrangle (Albany County), Foxpark quadrangle (Albany County) and Woods Landing quadrangle (Albany County). 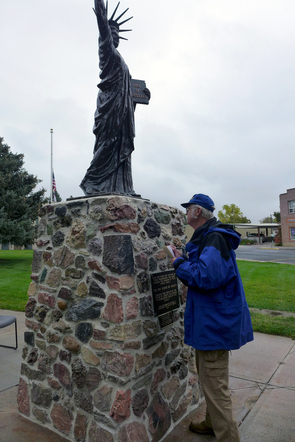 Despite the dreary October day, passersby of the miniature Statue of Liberty towering above the southwest corner of the Goshen County Courthouse grounds in Torrington, Wyoming, stop to ask the man examining the statue’s pedestal what he is doing. The man studying the 325 rocks that gives the copper statue its base is Wayne Sutherland, the gems and minerals geologist at the Wyoming State Geological Survey (WSGS). “The large number of rocks found in the base of the Little Sister of Liberty Statute in Torrington is impressive,” Sutherland says. The inquirers’ wide smiles across their faces glow with pride for the statue that has stood since Nov. 11, 1950. Many point out their favorite rocks or fossils and comment on what they believe them to be. The statue is one of more than 200 replica Statues of Liberty, called Little Sisters of Liberty, the Boy Scouts of America dedicated as part of its 40th anniversary crusade to “Strengthen the Arm of Liberty.” It was post World War II and near the start of the Cold War era. The Boy Scouts’ effort in the late 1940s and early 1950s led to copper statues erected on courthouse lawns and in city parks in 39 states. In Wyoming, statues were erected in Torrington, Cheyenne and Rawlins. Today, there are fewer than 150 remaining, says Goshen County Clerk, Cindy Kenyon. Like many others, Torrington’s statue fell into disrepair. “Over the years, our Little Sister had suffered in the Wyoming weather. Hail had been quite unkind,” Kenyon explains. In 2016, Kenyon and courthouse facilities manager, Tony Richard, began a project to recondition the statue and its base. The statue’s hail-damaged crown was repaired, lacquer was restored and old mortar was repointed. Lighting was added to the area as well. After repairs were completed in summer 2017, Kenyon’s assistant deputy, Kathy Vannier, contacted the WSGS about identifying the variety of rocks and fossils in the base. “The base consists of many local rocks and minerals, and is beautiful to see,” Kenyon says. Communities provided pedestals for their respective Little Sisters. William Dean constructed Torrington’s statue, and the local Rex Young Society of Rock Hounds donated rocks for the base. 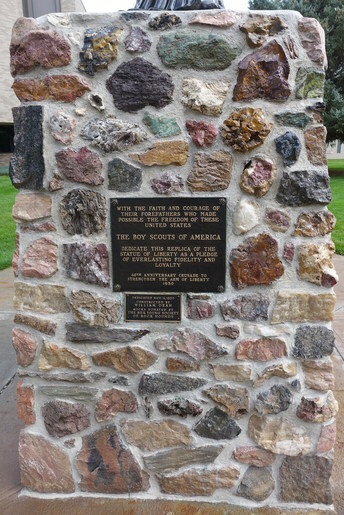 “The majority of the rocks collected by members of the Rex Young Society of Rock Hounds in 1950 or earlier appear to originate in the Hartville Uplift and other parts of eastern Wyoming,” Sutherland says. Sutherland spent more than half a day taking notes and photographs, measuring rocks and testing them for hardness. He also pinpointed where some rocks originated. The most common rock types mortared in the base include quartzites, agate/jasper/chalcedony, calcite onyx and limestone. The local limestones are often hosts for a variety of agate and jasper nodules, Sutherland explains. Other varieties include green fuchsitic quartzite, yellowish-green to black serpentenite, pink to red granite gneiss, quartz breccias in an iron-rich matrix and some limestone accompanied by purple fluorite, which appears similar to rocks found in the Bear Lodge Mountains near Sundance, Wyoming. “One of the most interesting rock types is a red quartz sandstone with cream-colored highlights that probably came from outcrops of the Guernsey Formation in the Hartville Uplift near Sunrise,” Sutherland says. With repairs complete and a record of what rock types make up its base, the statue shines as a bright light in Torrington. 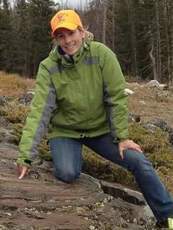 Erin Campbell will have a short move from her current office to her new one when she assumes the role as State Geologist and head of the WSGS on Nov. 21. She currently manages the Survey’s energy and minerals division on the second floor of the Laramie-based office. When she transitions to her new position, her office will be on the first floor. Gov. Matt Mead appointed Campbell as Tom Drean’s replacement, who is retiring after six years on the job (see story on left). Campbell is the first woman to hold the position. Campbell has more than 20 years of experience in geology in a variety of capacities. She holds a bachelor’s degree in geology with a minor in mathematics from Occidental College in Los Angeles and a doctorate in structural geology with a second emphasis in geophysics from the University of Wyoming. She spent four years with Chevron Corporation in Louisiana and California before returning to Laramie to teach at UW for 15 years. Campbell joined the WSGS in 2016. “I love Wyoming for its people as well as its geology, and I am honored to have been chosen by the governor to serve the state and its citizens as the next state geologist,” Campbell says. She says geology is a fantastic career because every aspect of this science is related to our lives, from the water we drink, to the oil and gas we consume and to the ground on which we build our homes. “Being a geologist in Wyoming is especially rewarding because of the geologic variety and incredible rock exposure. As I travel around this state and see rocks that I recognize, I feel as if I’m surrounded by old friends, and I can envision the billions of years of history recorded in them,” she adds. Campbell says she plans to work toward raising awareness about the work being done at the WSGS. She also intends to continue the strong direction established by Drean and will keep the WSGS focused on projects that directly benefit the citizens of Wyoming. She adds she is looking forward to serving on the many commissions and boards in the state that is required of the state geologist. “The Wyoming Oil and Gas Conservation Commission and the Wyoming Consensus Revenue Estimating Group (CREG) play crucial roles in the financial stability of the state, and I will ensure that the strongest geologic information is presented at those meetings,” Campbell says. Recent WSGS projects involving correlating Upper Cretaceous subsurface oil reservoirs in the Denver and Powder River basins have stressed the need for a comprehensive overview of statewide stratigraphy. Stratigraphy is the relative order and position of strata and their relationship to the geological time scale. Learn more about the stratigraphic chart and WSGS projects it will be used for here. The chart is free to download and available for purchase. Several pages on the WSGS website have been recently updated with current information. Be sure to see what's new in the various areas of study. The WSGS hopes Wyoming residents and visitors enjoyed our frequent social media posts about geologic features within the August total solar eclipse path. The goal was to provide an array of areas worth checking out while in the area to view the eclipse. We didn't come close to highlighting everything, but we provided a glimpse of the vast interesting geology to explore in the state. The WSGS's efforts in tying geology to the eclipse was recently detailed in an article in the September issue of "Outcrop," the newsletter of the Rocky Mountain Association of Geologists. The total solar eclipse was a sight worth seeing, especially in Wyoming. Our hope is that those who viewed it in the state also took time to see and appreciate Wyoming's geology. Information about some of the geologic features highlighted ahead of the eclipse can be found on the WSGS's "Visit Wyoming Geology!" interactive map. 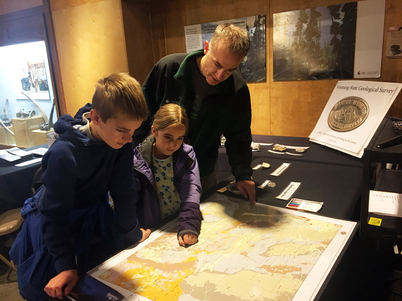 Chip Kobulnicky, with children Henry, 12, and Anna, 10, learned about geologic time periods using a Wyoming map on Oct. 14. The activity was part of the annual Earth Science Week event at the University of Wyoming Geological Museum, which the WSGS co-hosts. This year's event, "Wyoming ROCKS! To the Moon and Back," built off the momentum of the August total solar eclipse. More than 265 people attended the event.